Another still life done from the site size method. I was attracted to the cast shadows and the rhythm it formed from one object to another. An old brush from my sign painting days. A drift wood stick we found on the beach, that someone had carved initals and numbers into. 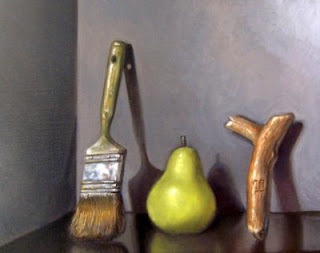 And of course those yellow pears that keep popping up in my paintings. I do not consciously think about a metaphor or any symbolism when constructing a set up for a still life. However when completed, there almost always seems to be some narrative to them. In this case I've titled the piece, "Philosophy". There is something hidden here among these subjects, some truth or knowledge. Some relationship we need to ponder. Or it could just be three items in a still life. This piece avaliable, to purchase click here. Lovely shadows and reflections in your still lifes. Jim, I enjoyed looking over your blog and appreciate your honest, inquisitive approach. Looking forward to seeing where you go with your art. Regarding this post, it is strange how in hindsight you see the connections that may have only been subconscious during the creative process. Finding those layers happens often to me, too. When I look at this particular piece, I see the word JOY, which was probably what you felt at some point while painting it. Very nice. Regards. Shari, Thank you, I really enjoy the play of shadows in a piece, often I think my work is more about that then the subject. Candace, Wow, I love that! I'm just getting a kick out of you seeing that word in the image. It is wonderful and amazing what other people pick up in your own work. Very satisfying to hear this.